Every year at this time, we look at what we have accomplished the year prior. For us at Genpak, 2018 was pretty dang busy. We worked on tons of custom projects with our partners, but also developed the new Clover hinged containers. The line offers a bridge from polystyrene packaging to a recyclable option without breaking the bank. At 100% recyclable, unlike our competition, Clover is a microwave safe, sturdy, and environmentally preferred option. Clover has been a hit across the country. While we were building a new product line, we also introduced new products to our current ones. ProView saw the introduction of the Close-Off containers, which provide separation for sides and mains. Customers told restaurants presentation is important. Getting restaurant quality food at home was key to delivery success. The introduction of Harvest Fiber rectangles, offer a different aesthetic for all kinds of foods. Grease and oil resistance just like our other top-of-the-line Harvest Fiber items. the rectangle design matches up with our existing FPR lids making the transition into fiber from Smart Set Pro an easy one. Fiber is sustainable, renewable, and commercially compostable. Our office here in Charlotte has united since we’ve been here a full year now. Comradery, collaboration, and commitment brings Genpak success. Our employees are committed to helping the communities where we work. Support for the Men’s Shelter of Charlotte started with our National Sales Meeting in January with a scavenger hunt for need items, and ended with collecting coats, food, clothing and monetary donations throughout the fall. Our US and Canadian team members collected over 5,200 food items for local food banks in 11 different states and provinces in the month of October. During the unfortunate natural disasters our country faced, Genpak provided food packaging for nonprofits feeding the first responders, volunteers, and families on the ground. 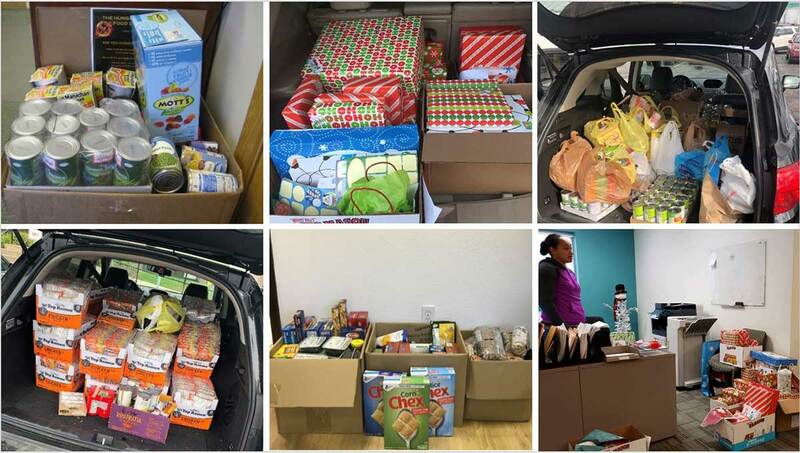 The holidays are the biggest time of giving around the world; at Genpak it continued. Our York County Adopt-A-Family enjoyed many gifts, the children at Lancaster Children’s Home got a special visit from Santa and Mrs. Claus, and Operation Warm collected new and used coats to help those who needed them the most. Our Jean Day donations throughout the year raised monies for Samaritan’s Purse, HopeWay Foundation, Charlotte Rotary, Susan G. Komen Foundation, Rock Hill Redskins, Second Harvest Food Bank, among others. 2019 will be a great year for Genpak. We will introduce new innovative packaging, continue to develop our employees, and work within our communities. Wishing you a very happy, healthy, and harmonious 2019! Looking back on the year of 2018 in food service, we’ve witnessed technological advancements in operations, the release of Genpak’s new products Clover and ProView, and at the heart of it all, new food trends that won the appetites of consumers. One of the most popular food trends stemmed from health consciousness, and it has been a driving force behind consumer food diet this year. Highly requested on the ordering app of America’s top delivery service, GrubHub, these new food cravings made their way to their list of top 10 most ordered foods. According to GrubHub’s latest food report, the bean burrito superseded some of America’s most beloved meals like the baby back pork rib (coming in 4th place) and the chicken sandwich (coming in 6th). Take a look below and let us know what your top favorites are from the list. Genpak offers convenient food packaging solutions so that consumers can enjoy their favorite food items in a convenient way. They are microwave safe for hot food any time, vented for freshness and crispness, and recycled into decking, toys and nonfood times. They are also compostable, leak resistant, and stackable to save space. Check it the video below to view our best selections or customer’s most ordered packaging. For more information, click here. All day breakfast has been a main player in a pool of ever-changing foodservice trends. Gone are the days when you were limited to enjoying your delicious breakfast, only for it to notoriously end at 10:30 A.M. This left last-minute customers anticipating a mouth-watering breakfast with hot coffee, until the lunch menu to flips over with the past never to return. Today’s restaurants are breaking the cycle of boredom, and consumers can now order their most craved breakfast items around the clock. The new breakfast expansion also inspires food product innovation, where chefs can build creative menus to excite the taste buds of customers. Responding immediately to new trends prompt productive business that translates into increased sales. One example of that is McDonald’s thriving all-day-breakfast menu launched in 2015. It consisted of McGriddles, McMuffins, breakfast burritos, biscuits, pancakes, yogurt parfait and hash browns. In the following year, “all day breakfast sales exceeded the company’s expectations,” according to CNN. The trend immediately impacted the growth of other restaurant chains to appeal to a wide range of consumers. Genpak has the right packaging for innovative meals suitable for any meal of the day. As a leader in manufacturing innovative packaging solutions, you can ensure that customers will be satisfied with the integrity of our food packaging. Clover is a microwavable, reusable, and recyclable container that was created as a sustainable, affordable option. It is by far one of the most versatile product lines for a variety of segments in the foodservice industry. It is not only offered in a premium black color, but in clear for authentic food presentation, and a modern stone color. Offered is a wide range of sizes from medium to large as well as 1 or 3 compartments. Turn food on demand and off-premise dining into one seamless experience with Clover. This product line is characterized by an attractive, modern appearance with recycled propylene material to suit various foodservice segments. Enjoy the features of the simultaneous venting-while-stacked feature to maintain the integrity of your food applications. 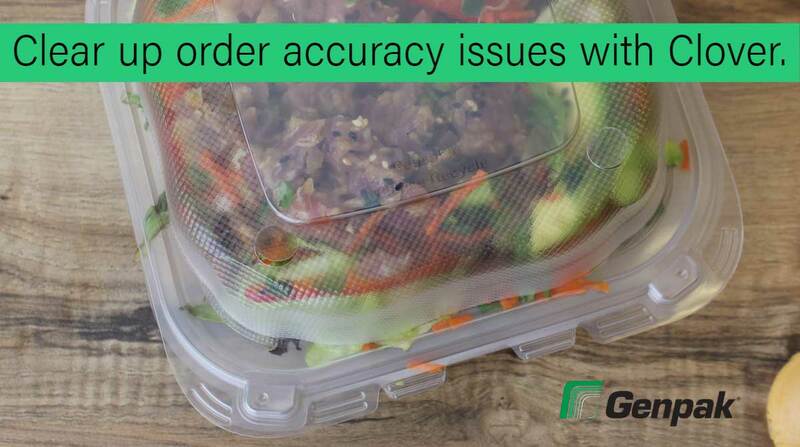 Check out the rest of our features and benefits below along with our video and see why customers prefer our new food containers. What to Expect from Clover by Genpak? 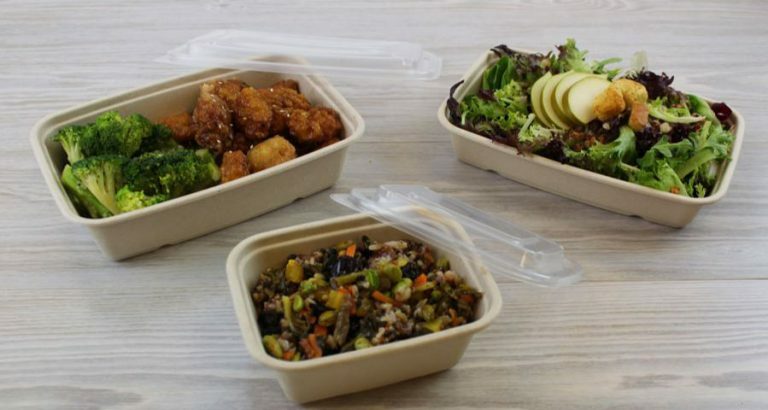 As a trusted leader in manufacturing innovative food packaging, we believe that Clover will make a great contribution to innovative dining concepts like home delivery, upscale catering, grab n’ go, fast casual, family style, school service, and take-out. It is anticipated to be a popular choice that will best coincide with the modern consumer lifestyle. Benefit from superior food presentation, authentic visualization, along with personal branding and labeling. These containers also complement a range of food establishments seeking optimum security, strength, and style. In addition to quality food packaging, your branding design allows for customer recognition, and ensures that your offer food packaging that benefits them. Clover allows for custom printing where you can enhance your company brand. 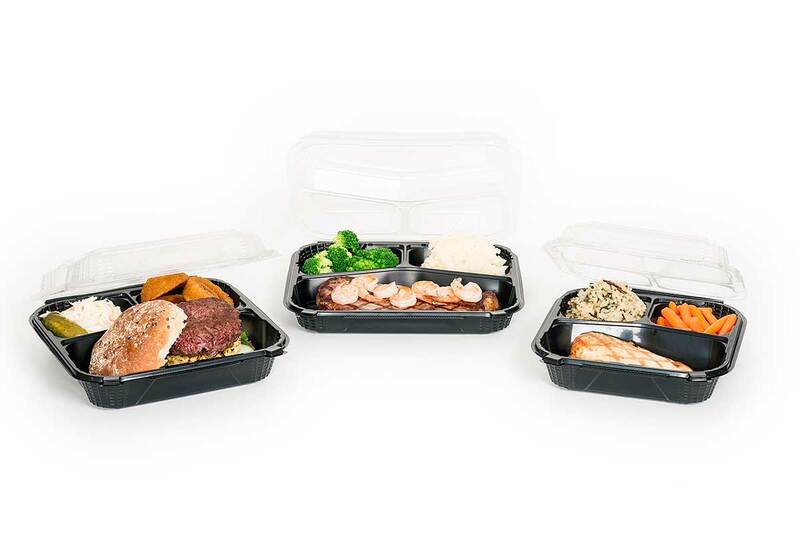 Designed for various food applications and eating occasions, they are microwave-safe containers created for food delivery, take-out, upscale catering, grab ‘n go, and more. Clover containers can be reheated to keep food items fresh and ready to enjoy. As a leading manufacturer in environmentally sustainable products, we strive to meet your eco-friendly goals. You can count on Clover as a great choice as it is curbside recyclable. One of the most convenient features of Clover is the ability to vent the container, even while stacked. 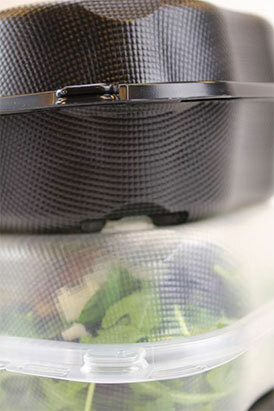 To keep food from spilling, the 360° clamshell design secures food items in one place. Genpak is a forerunner in manufacturing premium quality, single-use foodservice packaging products. 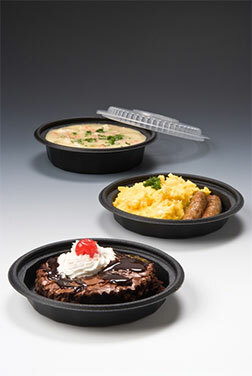 From microwave safe packaging, to sustainable plates and bowls, our company focuses on safety and innovation. Introducing The New Harvest Fiber Kraft Rectangles! Introducing the latest additions to the Harvest Fiber product line: HFR016, 16oz. container; HFR024, 24oz. container; and the HFR032, 32oz. container. The Harvest Fiber Kraft Rectangles are perfect for several occasions, including grab n’ go, takeout, and much more. They have superior strength, a modern appearance, and are also grease and oil resistant. Made from an all natural bagasse material, they are stackable lightweight and easy to carry. The Harvest Fiber Rectangle Container in size 16oz. can be paired with the matching lid FPR916, while the HFR024 and HFR032 best fit the FPR932 or the FPR932S. We are proud to say that this product effortlessly meets the demand for compostable and eco-friendly packaging. As a leading manufacturer in environmentally sustainable products, we strive to meet your eco-friendly goals. To learn more about our BPI certified compostable Harvest Fiber Kraft products, click here. To request free samples, click here. Experience is more than just a word when it comes to consumers – it is in fact a high priority. According to TrustPilot.com, “customer experience is how customers perceive their interactions with your company. 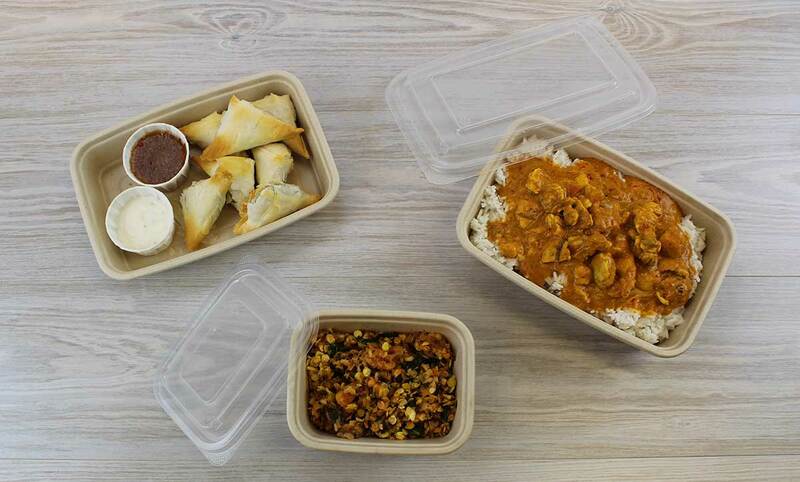 A successful strategy should be useful, usable, and enjoyable from the customer’s point of view.” With the following new lines of quality Genpak containers, you can ensure that they will offer your customers a convenient take-out/delivery experience. ProView does not back down from the competition since it is a distinctive product line for innovative markets. This collection of microwave-safe containers prove to be reliable for off-premise dining, all-day breakfast, grab n’ go, home delivery, and even for the growing ethnic flair that consumers are readily exploring. It features a sleek black base for superior food presentation and a clear lid for authentic visualization, order accuracy, personal branding, and clear labeling. The containers are vented for breathability and have a secured button lock with an audible snap. They are also comprised of a thermoformed polypropylene material to complement a range of food establishments seeking optimum security, strength, and style. 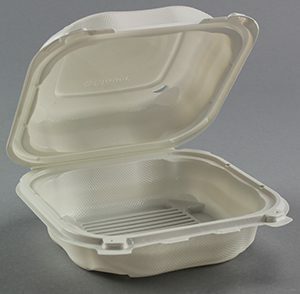 ProView offers a variety of sizes, widely ranging from a sandwich/snack container to a jumbo take-out container. When an economical alternative is required for food packaging, our brand-new Clover Hinged line will fit the bill. 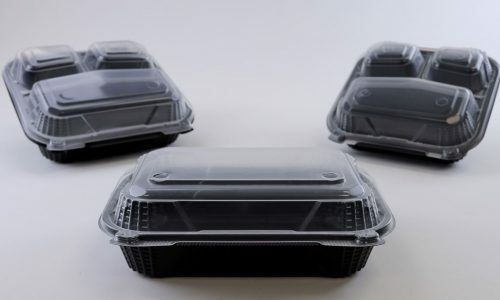 These new microwave safe, hinged food containers sport a clean, compact design that is perfect for any take-out program as well as for leftovers. The button lock, 360° leak resistant closure system ensures food products stay inside the container, and not on the delivery car floor. For more information on Clover, click here. 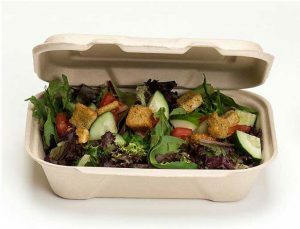 Harvest Fiber Compostable Containers mark an organic print on the environment as it is BPI certified compostable. 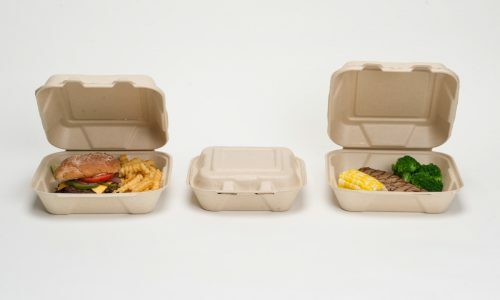 The containers are comprised of a base fiber called bagasse, a by-product of the sugar industry. An exclusive snap-it closure system, moisture resistant technology, and stacking rims for multiple to-go meals are vital features that upgrade the Harvest Fiber Kraft collection’s on-the-go abilities for some of your best food choices. With a growing influence of recycling and environmental awareness, this product effortlessly meets the demand for compostable and eco-friendly packaging. Colleges and universities have always been the powerhouse of ever-changing food concepts. They are reflecting campus menus to meet the demand of students’ food preference across the nation. With a growing concern for healthy food choices and organic labels, the key trend in colleges and universities is an increase in locally sourced produce. According to Foodservice Director’s 2018 College & University Census, 59% of food operators stated that the biggest trends affecting operations are vegan menu items. Out of dairy, baked goods, meats, beverages, and seafood, produce is the number one ingredient sourced locally. Many cafeterias have already taken the initiative to provide more sustainable campus dining. Duke University’s campus in Durham, North Carolina, offers 59 eateries which also includes organic produce. According to FoodTank.com, 25 percent of the food budget is invested in locally sourced items. Their dining program was awarded gold status for procurement practices in National Association of College and University Food Services’ 2017 Sustainability Awards in May. Providing the greatest demand for convenience, students have the option of getting their meals delivered to their dorms. You can store your best organic food items in our Harvest Fiber Containers and our Clear Hinged Deli Containers. Offering strength and security, these containers have a secured button-lock closure system to keep snacks from spilling. The moment a customer takes a meal home, not only do they focus on the food packaging for convenience, but the branding design to help remember your company. In addition to quality food packaging, your branding design allows for customer recognition, and ensures that your offer food packaging that benefits them. Genpak offers custom printing where you can enhance your company brand. From embossing to spot print, we offer four types of branding prints that will give you a competitive advantage. Embossing is a style that adds texture and dimension to your design It is a method of raising the design on the surface of the material. The design is pressed on to the material from underneath. This type of custom print is a repetitive design is printed across the container. When it comes to premium packaging that’s convenient for customers, ProView, Clover, and Harvest Fiber are products you don’t want to turn down. Not only are they sustainable, but they are also eco-friendly with several benefits. 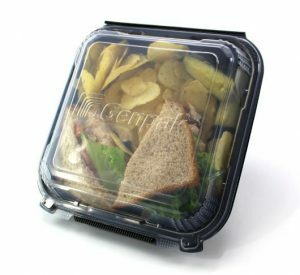 For more information on custom printing on Genpak’s high quality food containers, take a look at our quick reference guide. Wholesome Delis are Trending – Plus More on Harvest Fiber Kraft! Speaking of National Sandwich Month coming up next week, wholesome sandwiches are trending for today’s on-the-go consumer. Deli businesses are introducing cleaner labels, authentic food presentation, and ethnic flavors in their sandwich lineup as an alternative to fast food. Despite the classic BLT or the PB&J, ethnic flavors are topping them both as curious tasters think sandwiches with ethnic flavors are worth the switch-up. According to Technomic, 54% of consumers want restaurants to offer more sandwiches with new or unique flavors and ingredients. Pair wholesome, ethnic sandwich combos with Genpak’s Harvest Fiber Kraft collection. These containers mark an organic print on the environment as it is BPI certified compostable. Harvest Fiber in Kraft is comprised of a base fiber called bagasse, a by-product of the sugar industry. An exclusive snap-it closure system, moisture resistant technology, and stacking rims for multiple to-go meals are vital features that upgrade the Harvest Fiber Kraft collection’s on-the-go abilities for some of your best food choices. With a growing influence of recycling and environmental awareness, this product effortlessly meets the demand for compostable and eco-friendly packaging.